TORONTO, November 5, 2016—It was a showcase of exquisite, vibrant masks, all carrying a distinguished Asian flavour. Each mask radiated with the allure of the peony, the beautiful blossom depicting honour and prosperity in traditional Chinese culture. 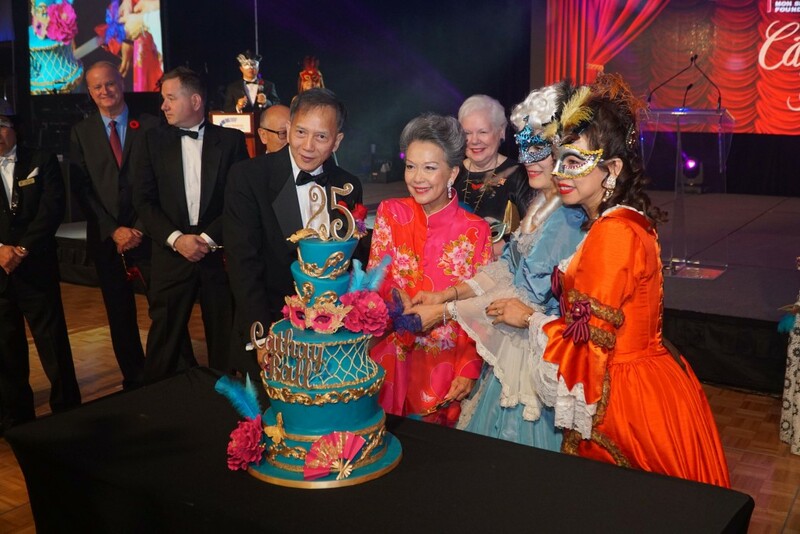 Over 1,300 guests, each with peony mask in hand, gathered at the Metro Toronto Convention Centre tonight to support the Mon Sheong Foundation’s 25th Cathay Ball. Mon Sheong chairman Tim Kwan, the founding chair of the Cathay Ball Hon. Dr. Vivienne Poy, and numerous past and present Cathay Ball co-chairs kicked off the evening’s festivities with a special ceremony. The Hon. Elizabeth Dowdeswell, Lieutenant Governor of Ontario, entered the banquet hall to a round of applause. Proceeds from the evening will go toward the long-term care centres and other charitable services of the Mon Sheong Foundation. As part of his welcoming remarks, Kwan described the Foundation’s latest development. “Mon Sheong has grown exceptionally over the past decade, expanding the scope of our services to meet the needs of the community. After our self-funded Private Care service was introduced two years ago, providing immediately available premium total care for seniors, the first phase of the Markham Mon Sheong Court began to welcome residents this summer. The second phase, which we expect to be completed by the end of next year, will include a Care Complex to house our Private Care and Charity Care units. It is our dream to add more long-term care beds to better serve the elderly. We look forward to the continued generosity of all branches of our community, including businesses, community groups, and individual donors, so that as a team we can build a brighter future together. To celebrate 25 years of the Cathay Ball, Poy was specifically interviewed for this year’s program magazine, providing readers a glimpse of the background and planning surrounding the inaugural gala. The Ball gave Mon Sheong much needed exposure and the profile of Canada’s first registered Chinese charity grew in prominence not only within the Chinese community, but also across the entire metropolitan area. Aside from the featured stories, the magazine also includes sections on travel and taste, wholesome living, and community partnership. One of the reception hall’s photo backdrops was even based off its cover design, giving guests a taste of what it is like to grace the cover of a magazine. To further fit in with the milestone, Presenting Sponsor CIBC donated 25 commemorative Year of the Rooster silver coins produced by the Royal Canadian Mint, awarded to lucky recipients as part of an instant prize draw. And that was only the beginning. 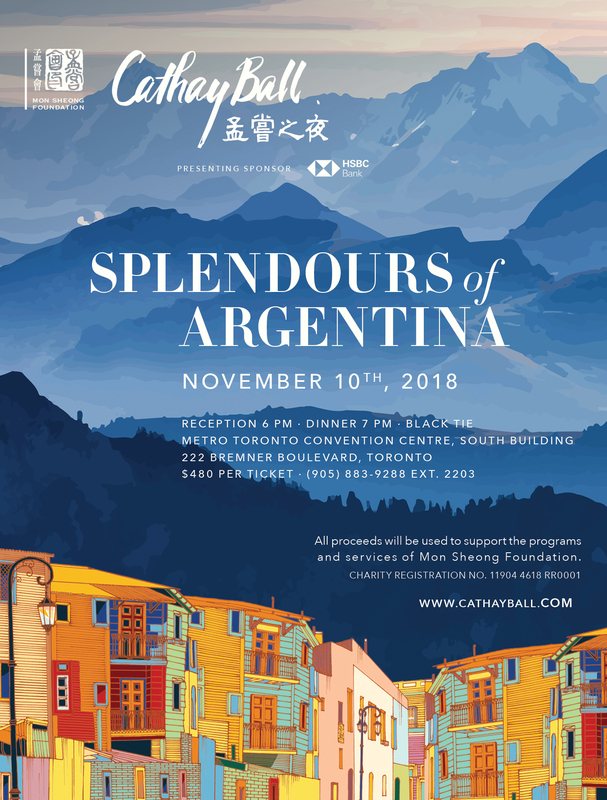 This year’s special draw, a yearly favourite at the Cathay Ball, had 250 tickets available at $100 each, with the winner taking home a pair of premium economy Air Canada tickets from Toronto to Europe along with $1,000 in travel money. The Mon Sheong Charity Raffle draw also took place toward the conclusion of the evening. Results will be published in major Chinese newspapers and on the Cathay Ball website. Another popular element at this year’s gala included complimentary whisky tasting which attracted many guests to savour the spirit while sharing their whisky experience. As with years past, the silent auction featured over 200 specially selected goods and collectibles, giving guests a head start on Christmas shopping. The entertainment program featured a spectacular mix of styles and genres. Julie Nesrallah, a well-known mezzo-soprano and radio host, sang a number of enlightening classics. Serghei Pogonet and his team performed Latin and ballroom dance. And guests were treated with the energetic, upbeat moves of the Samba performance. As always, the Cathay Ball received the generous support of many individual donors and sponsors, including Presenting Sponsor CIBC, Diamond Sponsor MediSystem Pharmacy, and Official Airline Sponsor Air Canada. The organizing committee would also like to recognize the contributions of the over 100 volunteers and Youth Group volunteers who enabled the event to take place so smoothly. To review highlights of the 2016 Cathay Ball, please visit www.cathayball.com. The Mon Sheong Foundation, established in 1964, is Canada’s first registered charity specializing in the Chinese community. It is dedicated to the promotion of Chinese culture, heritage, language, and philosophy and is home to three long-term care centres, an adult day program, three Chinese school campuses, a youth group, two community and volunteer services centres, three senior apartments, and assisted living, private care, and charity care units. Please visit www.monsheong.org for more information.